Taking their first steps in financial markets, novice traders inevitably face a choice – which trading platform to use? What are the pros and cons of each online trading terminal? How to avoid making a bad shot? This article will be especially useful for those who want to choose the right trading software. Brokerage companies provide a huge variety of trading platforms to trade in the Forex market: both their own trading software and third-party platforms. Let’s take a look at the most popular trading platforms, their advantages, disadvantages and key features. Although every user has his or her personal preferences how the ideal trading platform should look like, there are still some universal criteria we can rely on when choosing a trading software. 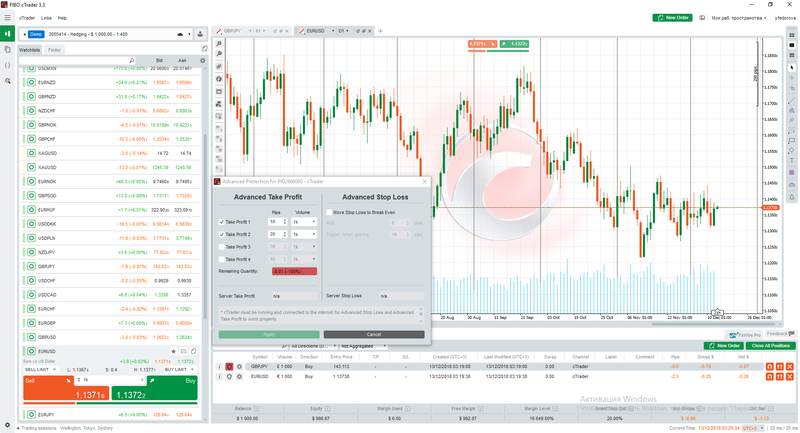 Intuitive and convenient interface, various settings and visual parameters – all this affects the perception of information and makes the trader’s work comfortable. All trading platforms ensure security and privacy, but these parameters largely depend on the broker, that offers software for trading. In addition to standard 128-bit encryption, MetaTrader 4 platform, for example, uses supplementary security measures to protect the transmission of data when performing trading operations – the RSA electronic digital signature encryption algorithm. This is perhaps one of the key parameters to consider when choosing a trading platform. Order execution speed and uninterrupted flow of quotes in a trading terminal are essential for any trader no matter, whether it’s the Forex market, or other types of financial markets. Time is one of the most critical resources for a trader. The software should respond instantaneously. If there is a delay or the terminal is slow, it may affect the update of quotes and trading charts, which, in turn, can lead to wrong trading decisions. Most trading platforms are compatible with all modern operating systems (Windows 7 and higher). Not all of them, however, run on Mac OS or Linux. Availability on smartphones and tablets is of key importance for traders. Mobile version allows them to keep track of the latest market events and make timely trading decisions. Traders often choose trading terminal based on their experience. Novice traders can have a hard time making up their mind. The best way to would be to compare several platforms, their main features and select the optimal software. 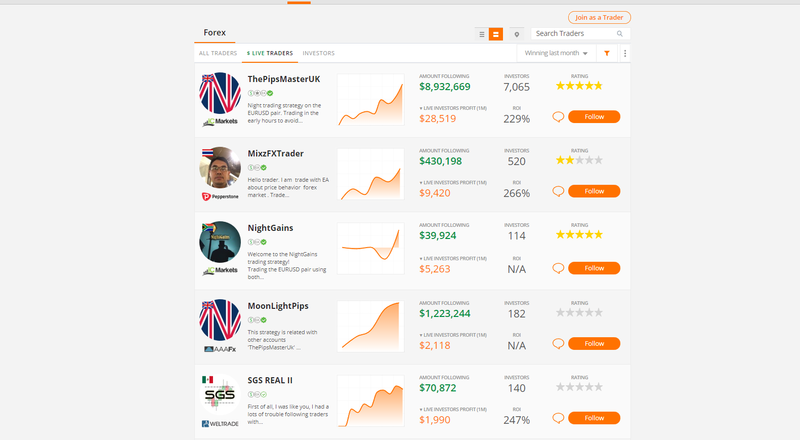 Ninja Trader is one of the most famous trading platforms used by many global brokers. The platform offers not only Forex and CFD but also stocks, futures and options trading. Ninja Trader provides an advanced development environment to test trading strategies and indicators, it offers extensive historical trade data with access to tick-by-tick, minute and daily charts. Stability and high performance are the main advantages of the platform, its comprehensive market analytics tools. The basic version of the platform is free and has a limited set of functionality, but it’s sufficient for independent trading and has most major features of the platform. Traders may also buy or lease the program with extended functionality (OCO orders, order modification, custom indicators, trading strategies and much more). Leases start at $50 a month. This platform will be suitable for advanced traders with vast trading experience. The obvious disadvantage is that the platform is not available for iOS and Android. 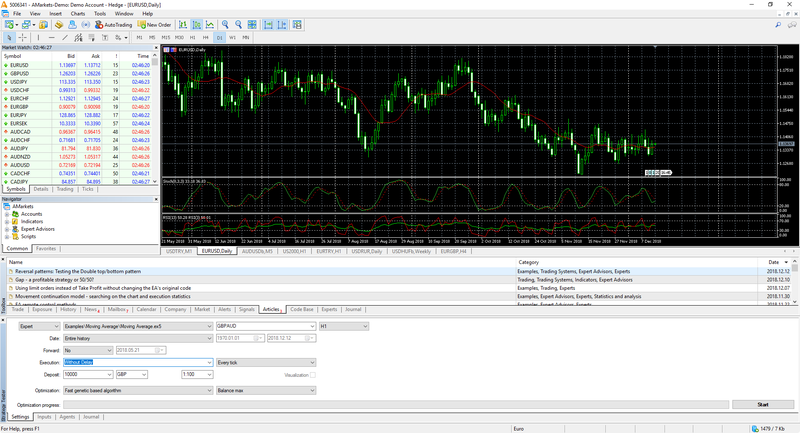 NinjaTrader has a convenient customized workspace. You can arrange all the necessary charts and data on the screen how you see fit. Another interesting feature is a built-in Strategy Analyzer, which allows you to analyze your strategy and trade data using Sharpe Ratio, Profit factor and other important parameters. Other popular platforms will let you test automated strategies only. 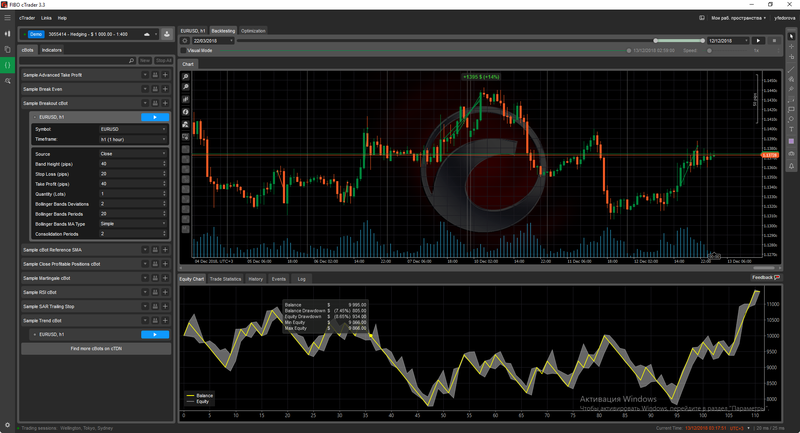 cTrader developed by Spotware Systems offers both automated and manual trading on Forex and CFD. cTrader can be accessed from PC and mobile devices. 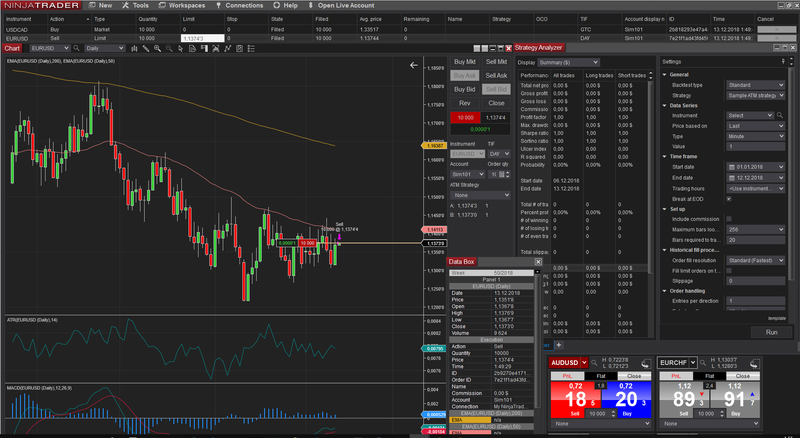 cTrader Web version is configured for mobile devices and tablets from all popular web browsers. The platform provides custom indicators and strategies. Traders are also able to download and use free user submitted indicators and cBots from Spotware’s cTrader Developer Network. Traders specializing in scalping and day trading will especially appreciate cTrader as the platform allows simultaneous order processing, which enables a lightning-fast execution speed. 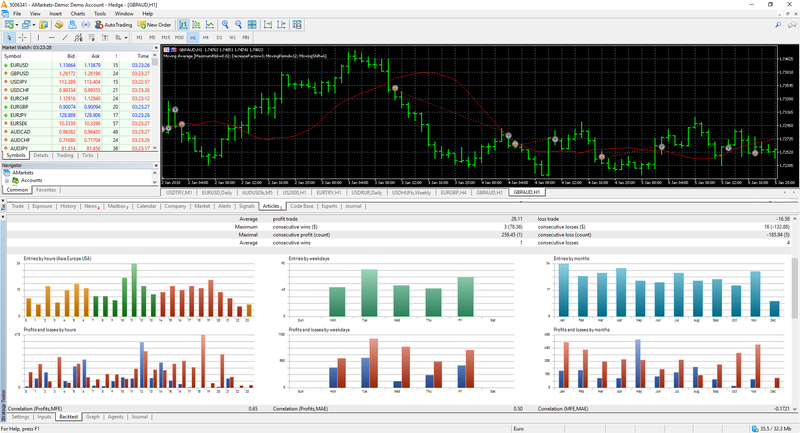 The trading suite offers 70 technical indicators, adjustable to any time zone, the platform supports the C# programming language, which is more popular among developers and gives more versatility than other languages, like MQL by MetaQuotes. The platform can be integrated with other services that distribute analytical reviews, trading statements, trading signals, offer trust management services and provide liquidity. We can say with confidence that switching to cTrader will be very smooth for a trader. The software takes a few seconds to download and has a detailed user guide. cTrader has optional color themes. If you prefer a regular white background and black letter, you can choose a light theme. Dark skin works better for darker environments and looks pretty stylish too. The platform offers interesting built-in functions, for example, “Advanced Take Profit”, which allows closing positions partially with multiple take profits, which in turn improves risk management, making it more flexible and efficient. Compared to other terminals, cTrader gives quick access to a more advanced and accurate algorithm development tools, it also has a built-in competitive strategy tester. 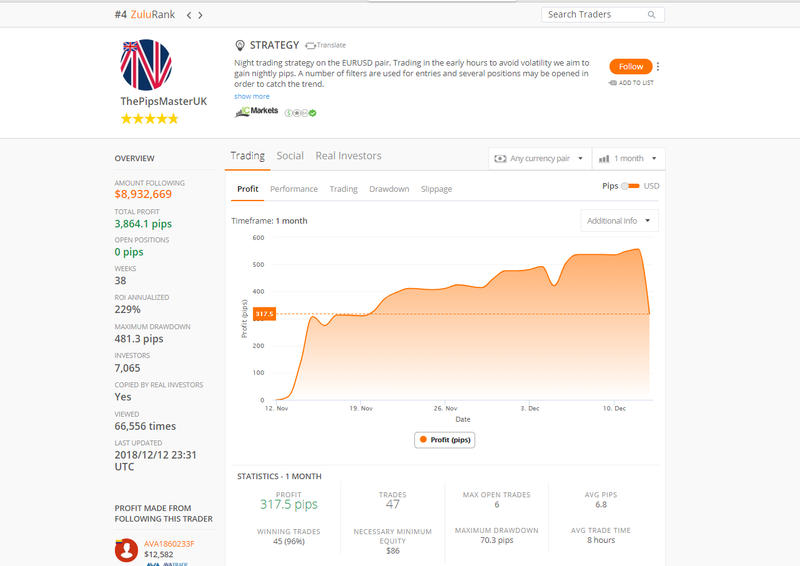 ZuluTrade is an auto trading platform. Essentially, it’s a social trading platform, a community of traders working with different brokers and trading on live accounts. And it’s represented by signal providers – traders who are willing to share their trading strategies and be copied and followers, who seek to copy the trades of experienced traders in the forex and financial markets. To assess the effectiveness of this terminal and the process of copy trading through signal providers, one can use Zulutrade Alchemy service, a new feature that displays Traders portfolio combinations and overall performance. ZuluTrade offers hundreds of signal providers which can be sorted based on various parameters, such as profit%, maximum drawdown, ROI, the range of traded instruments and even choose only those profiles which provide the videos with the strategy description. You can copy trades from live and demo accounts. The profile of every signal provider shows performance results, including yield curve and a more detailed analysis of all trades performed both in all currency pairs and in each pair separately. You can also see how much profit investors made, and which brokers follow this strategy. ZuluTrade users can exchange opinions and leave their comments and feedback on the strategy directly on the signal provider’s page. The signal provider ranking is based only on the rates of live investors. Although many brokerage companies strive to develop their own trading software, the MetaTrader 4 by MetaQuotes remains one the most popular trading platforms today. The platform allows Forex, CFD on futures and stocks trading, offering a wide range of tools for technical analysis and real-time financial news and indicators. The platform is compatible with any browser and all operating systems (Windows, Mac OS, Linux) and is available on iOS and Android. In addition to trading, traders can test strategies on historical data, create and modify indicators or scripts for automated trading, look for chart patterns and figures using various analytical tools, and much more. MetaTrader4 Mobile offers all analytical and trading functions of a desktop version. However, you can’t download and test expert advisors, purchase trading signals and view the quotes archive from your mobile device. The MetaTrader 4 terminal has gained popularity among traders around the world and is rightfully considered the best trading platform among beginner traders and professionals. It offers a perfect combination of convenience and functionality and high-quality services for algorithmic and independent trading. 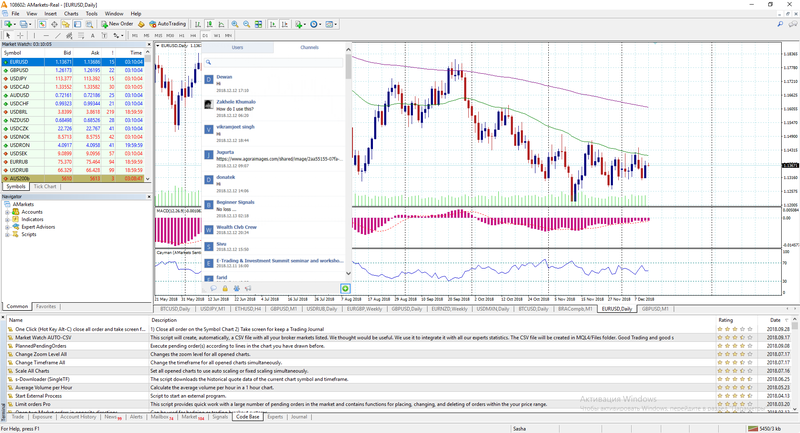 The MetaTrader4 platform has a simple and intuitive interface, no comments needed – just see it for yourself. The platform offers a built-in MQL community live chat. This option is often overlooked – it allows traders to communicate and find any registered member of the MQL community, knowing only his login. Some brokers use this feature to provide technical support to their clients directly in the terminal. MetaTrader 5 is a revised, state-of-the-art multi-asset platform, which is also popular among traders, who have already appreciated its earlier version – MetaTrader 4. The upgraded platform allows currency and CFD futures trading, on crude oil or shares, for example. MT5 offers advanced trading functions and superior tools for comprehensive price analysis and algorithmic trading, trading signals for copy trading, a wide range of indicators, real-time news feed, and, most importantly, a separate accounting of orders and trades. This feature implies two accounting systems – netting and hedging. Thus, the netting system compiles all orders on the same instrument in one position, while hedging system allows having multiple positions per symbol, including the ones opened in opposite directions, and each position is recognized as separate. Traders can monitor Stop Loss and Take Profit levels, as well as profit for each position. The difference between MT4 and MT5 is negligible. Some traders don’t even see it at first. We’ve already mentioned separate accounting systems. The platform also offers an extended set of timeframes – including nonstandard М2 and М3 or H8 and Н12, built-in economic calendar and alert system, which gives instant notifications of important events. And while the upgraded platform has more advantages, traders are still cautious about this new terminal. Maybe, they are just used to MetaTrader 4 and don’t need these additional options for their trading. MetaTrader5 has a similar interface as its previous MT4 version, so traders get used to the upgraded version easily. And although the platform looks almost the same, some significant changes were made to the Strategy Tester. It now allows testing Expert Advisors on multiple currencies and identify the correlation between them. Graphical display of test results became clearer. The results are presented in charts for more convenient analysis. The breakdown of profits by hours and days will show you which sessions are better to choose for trading. The forward testing option allows you to avoid the problem of “over-optimization”, dividing the database of currency and stock quotes for optimization into two separate parts, thus eliminating, the possibility of “parameter fitting”. The views and opinions expressed in this article are those of the authors and cannot be relied upon as trading advice or construed as providing recommendations of any kind. AMarkets shall not be held liable for any losses incurred from use of the information provided in this analytical review. AMarkets is international CFD&Forex online broker, which provides its clients opportunity to trade on forex, CFD, commodities, futures, indices, Equities and even crypto. We can guarantee you one of the best trading conditions and improved safety, by being a part of Financial Commission, which protects AMarkets customers from off-market risks. To open real account with AMarkets, Click Here. To learn more about AMarkets, Click Here. To contact AMarkets, Click Here.